The G-Shock GA-800 is an upcoming analog-digital series featuring three analog hands and a front-facing LED light button. 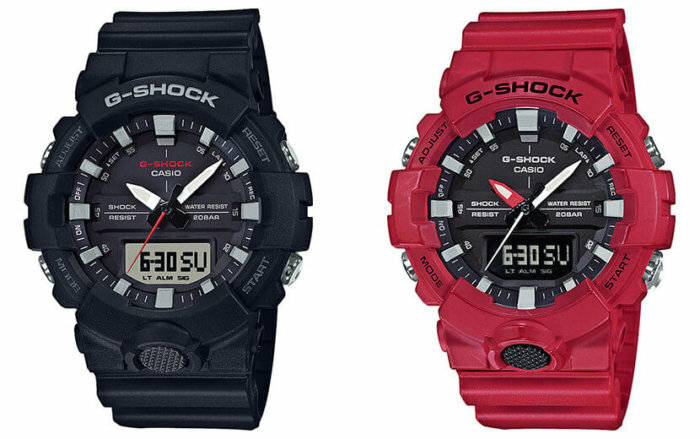 In addition the the black GA-800-1A and red GA-800-4A revealed by G-Shock Australia, the GA-835A-1A, a special commemorative edition, will be part of the upcoming 35th Anniversary Big Bang Black Collection. The GA-800 has a similar case design to the GA-700 but unlike the very large GA-700 it is a mid-size and slimmer model measuring 54.1 x 48.6 x 15.5 mm (versus 57.5 x 53.4 x 18.4 mm for the GA-700). It is also smaller than the popular GA-100 series which measures 55.0 x 51.2 x 16.9 mm. 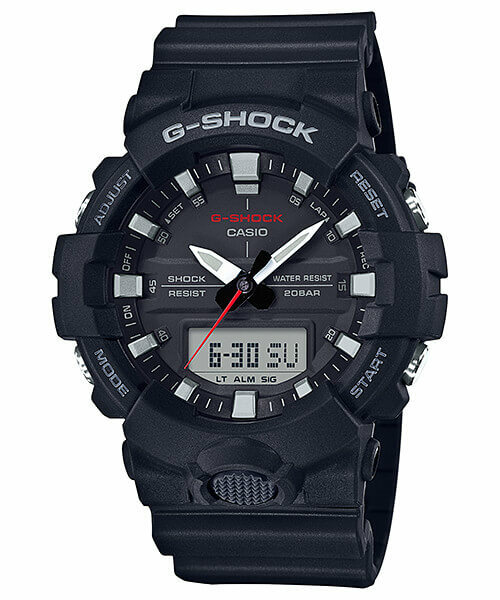 The GA-800 will also have the distinction of being the most affordable analog-digital G-Shock that has three analog hands including a second hand. Most of the affordable analog-digital G-Shock watches only have two hands for the hour and minute with second data showing on an LCD subdisplay. Until now the three-handed analog design was reserved for the more premium G-Shock models. This makes the GA-800 a good choice for someone who wants a more traditional analog watch that isn’t extra-large. Another distinguishing feature useful to athletes is the one-press elapsed time measurement activation from timekeeping mode and a lap memory with 120 records. 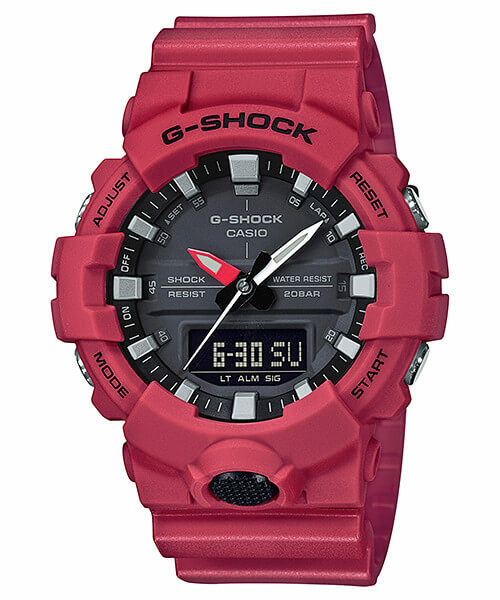 Other features include G-Shock’s usual shock resistance and 200-meter water resistance, dual time (with home time swapping), auto double LED light with afterglow, stopwatch (1/100 second for the first 60 minutes, 1 second after 60 minutes, up to 23:59’59), countdown timer (100 minutes), 5 daily alarms, hourly time signal, hand shift feature, 12/24 hour format, and estimated 3-year battery life. In Australia, the GA800-1A and GA800-4A have a list price of $269.00 AUD (~$211.38 USD) each. The GA-800-1A and GA-800-4A are likely September 2017 releases. Update: G-Shock Japan announced the GA-800-1AJF and GA-800-4AJF for a September 2017 release with a list price of ¥15,000 JPY each. Congratulations Casio, this analogue model looks awesome and a definite must have. Lovely clean looking, beautifully legible, unfussy design and not too big. Got a feeling this model will be incredibly popular. Will this watch have the “move the hands to see digital” quick button, like the GA-700? Yes it has the hand shift function. I have purchased the GA 800 and the way things are going I expect to not purchase another watch for a long time simple tough elegant & sporty ticks those boxes well . The light is a mini torch . It does all the things a timepiece should do .